I am in Stephen’s Downes session on critical literacies. The session happens to be during lunchtime so the audience is relatively small. Perhaps the #cdnelt community is not familiar with Stephen’s work and research in the area od educational technology and online learning and teaching, or perhaps it’s the lunchtime effect. Aside from edtech and online learning, Stephen used to live in Manitoba, so another connection there. Currently, he works with the National Research Council. Glen Cochrane introduced the featured speaker and mentioned that Stephen brings edtech and multidisciplinary approach to the conference. Stephen started the session with a reference to LOLcats, images containg cats, or other animals, and grammaticaly incorrect text. the MOOC – designed in such a way that can be taken by thousands of people. The first MOOC launched in 2008 had 2200 learners. After that Coursera, Udacity, edX, FutureLearn came about. There are thousands of MOOCs available now. xMOOC created by Standford focuses on content delivery, based on Khan Academy. Even though the first videos on Youtube were awful, they were immensely popular. THere was no formal curriculum for the first MOOC. The designers created a network, where learners were assumed to create knowledge and learn from one another. On the other hand xMOOC provide the content. 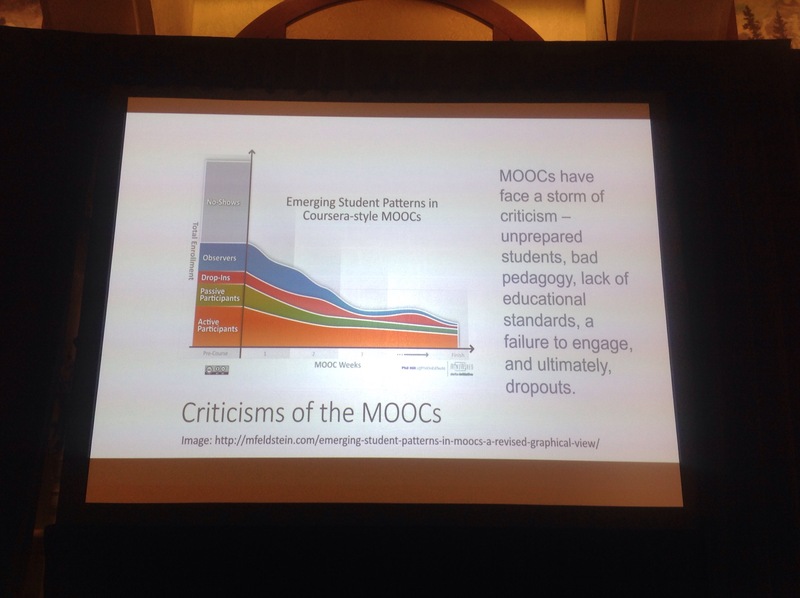 MOOC pedagogy was bad, is bad. The software created for them was awful. 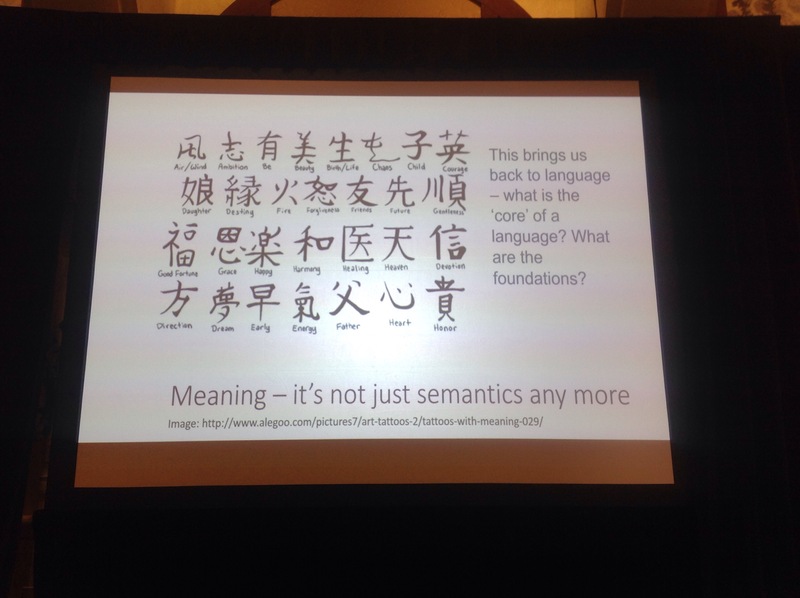 MOOC are mechanistic, do not egnage students. People are islotated, just looking at the computer. Types of participants, Stephen often falls into the observer category, like me. Event though a percentage of actual completions is small, it is a huge success to have those participants complete a course. *** Stephen is asking for a wider understanding of what a course is and what a participantion means. A wider conception of learning. He mentioend the morning breakfast buffet. Were we asked to start at the beginning and go step-by-step through to the end? No, you begin by finding your fork. Are they placed at the beginning of the table? soemtimes not. Newspapers – are we obliged to read every single article? No, we pick and choose. Excellent point! In learning, the idea that you begin at a certain point and you move in a linear manner is irrational. Common COre – bad idea, well executed. The importnat things is to understand whats going on, rahter then the formulas and principles. Language, all languages have a different approach to the verb to be. We want to go beyond the principles and rules. We need to get past the basci idea about meaning, comprehension and understanding. Snow is white if and only snow is white. Emojipedia.org the search engine for emojis Stephen doesn’t know why people use them [laugh]. Meaning defined by what the word doesnt mean. Meaning is performative. Meaning is use. Knowldege as recognition. Our knowledge itself is insufficient to account for these various dimensions of literacy. When we see our grandmother, we recognize her automatically. To know something is to rezognize it. A colleague was looking for a link to my liveblog, and I am about to publish it now, so I might have misunderstood what a liveblog is :) Was I just taking notes? Next time I will try a google doc and share it. Apologies for typos. Will not use WordPress on iPad again for this type of exercise.